If lightning protection measures are required according to DIN EN 62305, among others, the SBGX 01 can be used. 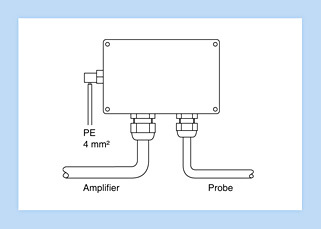 This device is inserted in the sensor line between the measurement probe and amplifier. The voltage induced in the sensor line by a lightning strike is limited and diverted to earth. The frequency and duration of the occurrence of a hazardous atmosphere determines the zone classification. Zone 0 is an area in which a potentially explosive atmosphere in the form of a mixture of air, combustible gases, vapours or fog continuously, for longer periods or frequently exists. Zone 1 is an area in which a potentially explosive atmosphere as a mixture of air, combustible gases, vapours or fog can occasionally form in normal operation. Zone 2 is an area in which a potentially explosive atmosphere as a mixture of air, combustible gases, vapours or fog can occur in normal operation. Zone 20 is an area in which a potentially explosive atmosphere in the form of combustible particles suspended in air continuously, for longer periods or frequently exists. Zone 21 is an area in which a potentially explosive atmosphere in the form of combustible particles suspended in air can occasionally form in normal operation. Zone 22 is an area in which a potentially explosive atmosphere in the form of combustible particles suspended in air normally does not exist or only exists for a short period in normal operation. 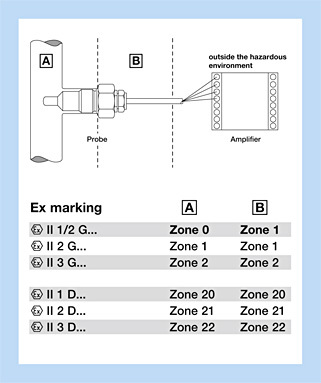 A measurement probe may only be used in dust or gas protected hazardous areas, even when there are approvals for both areas. For use in hazardous areas for dusts the maximum surface temperature of the sensor is specified. For the hazardous area for gases the ambient temperatures of the temperature classes are given.